One of the best real stories I have read written by a good friend of mine who is a real “JKA Sensei”. In the spring of 1984, Brad Jones – at the time a member of Canada’s national karate team – was broke, unemployed and facing the bankruptcy of his beloved karate dojo. When a “friend” offered him the opportunity to make “easy money” in the lawless tribal lands of Pakistan he saw a way to escape his hopeless situation and he took it. What followed is an unforgettable journey that led him from a dojo in Toronto to a meeting in Peshawar with a group of men bearing Kalashnikovs, who gave him a hollowed-out typewriter case filled with three kilograms of hashish oil. From there he began a harrowing trip across Pakistan and India, frequently coming in contact with soldiers and police searching for his hidden cargo. The journey ended in a prison cell in France, where another long voyage began, one that robbed him of his freedom, his dignity and nearly his life. 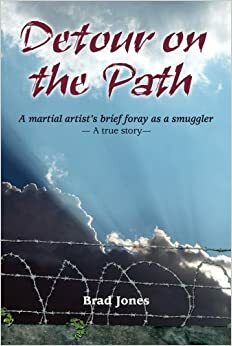 Detour on the Path takes readers on a suspense-filled adventure that shares with them lessons on the power of discipline, hope and the human heart that are learned in the Martial Arts. The story and its message will resonate with anyone has preserved through times of trouble. Brad Jones is a JKA 6th Dan black belt in Shotokan Karate. He competed for Canada in the 1983 World and Pan American Karate Championships and other international events, and coached the Canadian national karate team for five years. He was inducted into the World Martial Arts Hall of Fame in 1996, and currently teaches karate in New market, Ontario.